There is one last chance to qualify for the 2009 CrossFit Games. Below are three workouts chosen from the pool of regional qualifiers. All three must be completed before 0600 PDT on May 31st, 2009. They can be performed in any order, spread out throughout the 24 hour period. All three workouts must be videotaped. The video is solely for documenting the workout. The camera should be positioned so that proper range of motion can be determined. Use a tripod if at all possible. Move the camera as little as possible to ensure proper coverage. An additional person with a stopwatch must be in the frame for the whole workout (the stopwatch does not have to be visible). The time on the stopwatch should be presented to the camera at the end of the workout. There should be one obvious close up of the weights to validate official loads. Special consideration for Workout 2 (Jackie). You must show the rower monitor at zero for the start. Without cutting, the athlete must be shown initiating the row, and at the end, the camera should show the monitor at 1000 meters or more. A description of this last part is in the How To Video. The videos must be uploaded uncut and unedited to a public forum. Vimeo is our first choice, but YouTube or any other public arena is acceptable. You can upload each workout separately or put them together, your choice. To be considered for the Last Chance Qualifier, you must email your times (each workout alone and the total combined for the three) and the link(s) to the video(s) to lastchance09@crossfit.com before 0600 PDT on May 31, 2009. We are expecting hundreds of submissions, so there will be little to no tolerance of missed guidelines. Questions can also be addressed to lastchance09@crossfit.com. 74 comments on this entry. Some of us overseas don't have streaming video capability. Is there any way to get the standards typed out? Can we set the rower to 1000 M and show it set, then count down to 0? We do not have rowers available in Iraq. Will SDHPs count? Awesome, I don't have a rower, so I'll sub running, as I'm only doing them for fun, not expecting to qualify! I think I'll do them in the order posted actually. An advantage for me in the UK (it's 2pm here) is that I can do 1 and 2 today, and then have a nights sleep and do 3 in the morning! Workout #3 is HARD, I would recommend it first! Only 5 women completed it rx'd in under 15 minutes, and less then 1/3 the men. Is WOD 2 Chest to bar? If it's clear that all 1000m were rowed, fine. 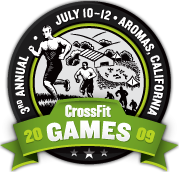 The movement standards are mostly the same as the 2008 Games, which are found here http://games2008.crossfit.com/documents/GamesFormat_Final.pdf. This covers thruster, chest to bar pullups, and deadlifts. The clean starts on the ground and ends on the shoulders with the hips and knees fully open. The KB swing initiates with the KB between the legs and solid contact with the arm and the leg. The swing finishes with the arms extended overhead (the ear must be obscured by arm) with the mass of the ball over the handle. In other words, droopy bell syndrome, where the mass of the bell does not travel overhead, does not count. With the double-unders, missed attempts do not count. Only successful jumps with two passes of the rope under each jump count. No, the video says chin over bar. No. Jackie does not require chest to bar pullups. Only chin over the bar. The head should retain as close to natural anatomical position as possible. Craning is not forbidden, but considered inferior. Equal times, one guy cranes, one doesn't, we'll select the one who doesn't. We're running around looking for a rower now. Hoping we're able to find one, but if not, I'll do the sub anyway and see what happens. There is not a good sub for the rower. If there is ANY way you can find access to a rower, please do so. If there is really NO chance you can get to one, please perform 100 SDHP with a 45lb barbell where the bar travels from a few inches below the knee to above the clavicle. When you submit your times and video links, please provide an explanation as to why it was absolutely necessary to sub the SDHP. If we have a large LED electronic timer in the video, can that replace the additional person with the stopwatch? If it's still possible to have another person in the frame, please do so. If not, and the timer is visible, please send the explanation as to why along with your times and links. The boys overseas don't have rowers. What are they supposed to do? Jeez, what a massive undertaking! Good on ya, Tony, and everyone involved for the gesture and effort involved in this. Assume goodwill and good intentions, for surely both are here in abundance. Ok youtube only allows 10 min videos.. Wod 3 from the qualifier most times were 15 min+ how are people suppose to upload this video. I'd also suggest that the initial shot of the video clearly shows the plates on the bar to verify accurate loading. It might be hard to tell 100% from a distance shot. Vimeo allows over 10min videos and is also free. Tony, is a stopwatch still necessary if our gym timer is clearly visible in the video during the entire WOD? Just finished the first workout. Want to say a big "thank you" to everyone involved in this undertaking. I completely agree with Bingo's comments. Even the slightest chance of having someone from our little JSS qualify for the games has given everyone over here a huge boost. Cheers to all. Now, let's go meet Pukie. If it's still possible to have another person in the frame, please do so. Another stopwatch isn't required. If another person in the frame is not possible, and the timer is visible, please send the explanation as to why along with your times and links. I'm out. I am going to do the smart thing and heal up for 2010. Good luck ladies!!! Can you please tell me ifthere is a 15 minute time limit for the 3rd WOD as there was in the actual qualifiers? Thank you. I was the timer for a friend doing wod #1, I f'd up and moved out of sight while she was doing the double unders but you can see me at the dl's. We have another camera that shows me the whole time but it does not show the side angle for her deadlifts. Should I send both videos or will you accept the first? There are no time limits. We are obviously going to consider the quickest times first, but no one will be disqualified for time. Keep the second video on hand but you don't need to upload it yet. Send the explanation with your times and links. If needed, we can view the second video later. Just finished WOD 1, feeling pretty good. Here it is if anyone wants to check it out/comment. tony, is there a decided number of spots available, and if so can you let us know how many male and female spots up for grabs? Can't wait to watch all these video's. Good luck to everyone competing! Nice effort Derek. I just finished the 3rd workout. Hoping someone can help me... Vimeo allows videos up to 1GB per file... my video is 1.52GB what should I do? Tony, sorry about asking on the rowers... you substition comment must of been in the filter or posted after I started writing my question. Thanks for the last chance qual! Number 2! Feeling a little smoked after that one. Nice vids man. That one hurt me more than workout number 1, although I suspect number 3 will be the worst! You can compress your video using iMovie or Windows Movie Maker. Vimeo has instructions for settings. Even high quality compressed videos are about a 10th the size of raw footage. Jason, Neal and myself were stoked that you chose an NEQ WOD for the Last Chance Online Qualifier. Thanks! We had a standard on the rack position that the elbows had to end in front of the barbell upon completion of the rep. A couple people lost reps for coming to full extension with the bar at shoulder height and then dropping it before their elbows came around. Not a huge issue but perhaps something to consider clarifying. Good on you for that standard. At this point, since it wasn't clarified specifically from the get-go, we're not going to enforce it. Full extension with barbell on the shoulders is the standard for today. I would like to personally thank Tony Budding for his availability in answering all the questions myself and others have posted on here. THANK YOU!!! The CrossFit community is an amazing one that I feel proud to be a part of. Me and my ground beef looking hands will be finishing up the last one in a couple of hours. WOD #3 is rougher than it looks. I have never seen so much blood in my life. tony, i don't know if you didn't see my comment or if it isn't decided or if its classified info at this time, but my question about the number of spots available, and the method of scoring was the only question you haven't answered. i appreciate your availability to the community on this matter, and even a "go f@ck yourself" would be appreciated! haha. You can compress your video using iMovie or Windows Movie Maker. Vimeo has instructions for settings. Even high quality compressed videos are about a 10th the size of raw footage. This compressing isn't editing, it's shrinking the actual file size. It will dramatically reduce the upload times (even with high quality settings). Raw footage is unnecessarily HUGE. We haven't announced the number of spots available yet. Scoring is based on time to complete all the workouts with proper movement. We had an issue with our camera equipment on workout #3 and it stopped before the stopwatch made it to the camera. The entire WOD was completed and captured and the time shows on the bottom of the screen, but no stopwatch shot at the end. Not sure what to do about this? We turned it back on right away and took a photo of the stop watch...is this going to cut it? Do we send it in with explanantion or am I screwed? Derek, on WOD 1, you are using some superball plates? Looks like you're getting a nice bounce on those things. I want to say THANK YOU SO MUCH to everyone at Firepower Training in Milton, Ontario (www.firepowertraining.com) for helping me with this today. Shawn, Brian, George, Mark, Andrea, and Ian and everyone who was yelling and cheering me on, you guys are so amazing and I could not have done this without your support, it means so much to me that you were all there willing to give your time to help me try and qualify for Cali. Even if I don't make it, it was worth the experience to try. I will be going to Cali regardless as a spectator and to support my friends who qualified in the Canada East regionals. Also thank you very much to Tony for being available to answer questions so promptly. Looking forward to getting stronger for next year!! The purpose of all these regs is ensure the workouts are legit. Send the explanation along with the times and links. We'll give it fair consideration for sure. Thanks for this opportunity. An injury prevented me from competing in the Mid-Atlantic competition, but this qualifier came at just the right time. Derek, thanks for sharing the videos, great effort, keep up the good work! Just finished WOD #3. Absolutely killed my grip. Here's my times, best I can remember them. I'll double check when I'm uploading video's and then e-mail them to the proper address. Just wanted to put these up and see if I could get some feedback. I can't take the waiting, hope these are good enough. All you firebreathers out there let me know. Good luck to everyone out there. Sorry to see you are holding out this year Miranda at 801. Maybe you can help win the affiliate cup this year??? Hope your back is 100% real soon here. Great times Tommy. Good luck. did you do videos? We had the Oregon games today in bend, missed you man. You gotta make it out next year. First wod was a run with short movements mixed in. final wod was 155lb. grace. you would have done pretty well. Wow what a day!!!! I think I might lay in bed all day tomorrow....That was amazing. Thanks for all of you that put this together. It was fun and I'm glad I got to participate. Not sure what kind of bumpers they are but the flooring is squishy rubber. Not as stable as I like for lifts. I am having serious issues! The videos that I have uploaded to vimeo is now not working. I have viewed the videos after the completion of the upload but now they are blank. I am in the process of uploading 4 videos to youtube but it is 12:18am and Im not sure it will work. What should I do? I have the videos on my computer and can deliver a stick drive to you tomorrow but not by 6am.. Thanks very much to you and your crew for all the work on this Tony. On jackie most vid's nobody is getting chin over bar,everyone is cranking there neck,i thought standrd was no cranking.please advise,on what it was. Seeing a lot of vids with guys cranking out some killer times that don't conform to the video guidelines (showing weights etc.). We went to great pains to make sure we did everything to the letter, be a shame for those guys if they get DQ'd. WoW! You crushed everything. You'll be in Aromas. Nice job! 1. Anyone know when the results will be posted? 2. Anyone else out there is trying to qualify while deployed? All vids were sent in on time with wod times attached. Unfortunately, wod #3 erased from youtube due to time constraint-over ten minutes (12:11). Now working on uploading to vimeo and sending in. Tommy, great job on the times as well. 1. Does anyone know when the results will be published? 2. Anyone else out there trying to qualify while on deployment? Workout 2 time: 6:34 - http://www.youtube.com/watch?v=6nkMvfh3vPQ Our gym trainer Russell was not here to operate the clock. I thought it was on a progressive timer but it was on a tabata timer. The rounds are one minute rounds. The rounds start at 1....total time for WOD was 6.34. Nice times! Bummer on the DU meltdown, hopefully it's still enough because your other times are great. Way to go and good luck. I was out of town yesterday, so I caught up on the workouts today for fun. Overall, I'm happy with my time, but this is definitely not the same as competing at an actual event. No stress, no butterflies, just show up at the gym for a "workout" ... still fun, but not the same. Very impressive times Anthony. You're definitely going to Aromas. Wow! Freakishly fast times as well. Did you get these on video? That's the fastest I've seen yet for the clean, pullup, swing WOD. We have never met, but I would like to ask why you did not try to qualify? Reading between the lines it seems Coach/Tony/HQ put this out there primarily as a way to give you a shot and right the weird situation at CW Quali. Based on the times posted you would have been a strong contender, so why did you not try for it? That DL/DU WOD time is sick, I have to try that and see if I can even get remotely close (those are two strengths for me as well). Maximus, the last chance qualifier was announced before our event took place, so I don't think it had anything to do with us. I didn't try to qualify because we were traveling on Saturday and couldn't meet the time constraints. As for the DL/DU workout - it was by far the worst event. I'm not very good at double unders so they took everything out of me and made the deadlifts a lot worst than they should have been. Chris Woods was sub 3 on that one!! there ARE rowers in IRAQ. just not where you are.